Every year, southern right whales travel all the way from the Antarctic to the coasts around South Africa. 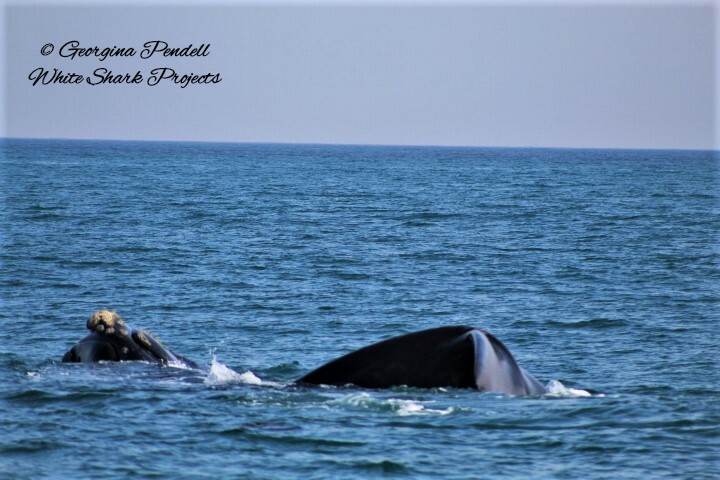 These gentle giants start arriving here roughly around June specifically to mate and calf. Once the calves are big and strong enough to make the long journey, the mothers will take them back down to the Antarctic, usually around end of November/ December. 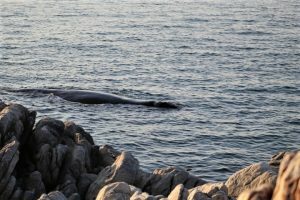 One of the best places to see these gigantic creatures, both from land and on a boat, is right here in Gansbaai. Southern right whales with Dyer Island in the background – taken from White Shark Projects cage diving vessel, Shark Team, while we were on anchor. Southern right whale showing its distinctive callosities. 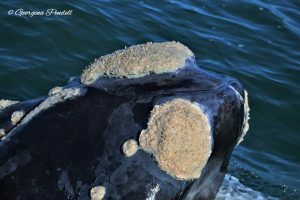 Southern right whales, like other right whales, are easily recognisable by their callosities – patches of hardened thickened skin which appear yellow/white due to the whale lice, barnacles and worms living on them….gross eh? 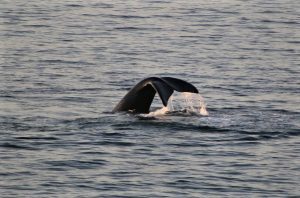 They also have a broad wide back without a dorsal fin and a long arching mouth that begins above the eye. Southern right whales are usually black in colour, with some white pigment on the belly which ranges from a spot to a large irregular shape. This flash of white is why these whales often get mistaken as the dreaded bachelor orcas Port and Starboard when visitors are whale watching from the shore. 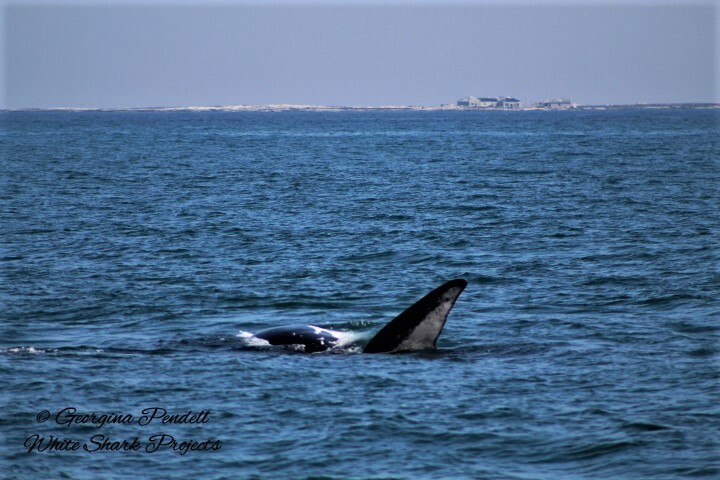 However, there are a few pigmentation patterns the right whales can have that all comes down to genetics….but we are not going to get too sciencey here. There is also a brindle pattern where the calves are born almost completely white, with black speckles. I actually saw a brindle calf the other day and it reminded me of a giant dalmatian to look at, just a lot less boisterous. The white pigment gradually darkens with age and becomes a more grey colour in the adults. The size of an adult female on average is a whopping 14 metres with a maximum of 15.5 metres with males being just a bit smaller. Southern right whale showing the unique pattern of callosities. 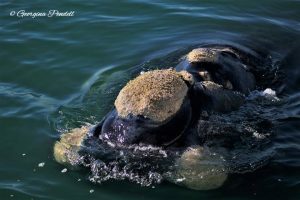 This year has been a record breaking year for southern right whale numbers in South Africa. For the past 39 years the Whale Unit at the University of Pretoria’s Mammal Research Institute has conducted an annual aerial survey of southern right whales. The survey team recorded every individual whale they saw along the coastline from Nature’s Valley to Muizenberg. They also took photographs of every female whale that had a calf with her. The photographs are then used to identify each whale by looking at the pattern of callosities (patches of thickened skin) which is unique to each individual whale. This year, the survey team recorded a staggering 1,106 individuals, of which 536 were calves, making it a record breaking year. I actually remember in 2016, we were all extremely worried as there were only 55 mother – calf pairs counted in the survey….. well, they have come back in abundance this year! Mother and curious calf came up to check out White Shark Projects cage diving vessel, Shark Team, while we were on anchor. Even though White Shark Projects is a shark company and does not actively seek whales, sometimes we are lucky enough to see them from the boat on way to our dive site. Also, occasionally we are extremely lucky to have curious calf come up to our shark cage diving vessel, Shark Team, while we are on anchor. This year we had an extremely rare and incredible event happen while we were on anchor. A calf actually came right up to our cage which had divers in…. it seemed very curious about what was going on. Of course, then mum had to follow to tell her calf to stop playing around. White Shark Projects also take our volunteers whale watching in De Kelders, which is a short distance from Gansbaai town. Here you can sit on the rocks and enjoy watching these majestic creatures without even stepping foot on a boat. What better way to spend an evening than watching these gentle giant whales with the breathtaking South African sunset in the background. This whale season has been truly incredible and as it is drawing to an end with the whales starting to take their calves back to the Antarctic, we are left with memories that will last a lifetime. People will be talking about this record breaking season for years to come. The wildlife around Gansbaai never ceases to amaze me. 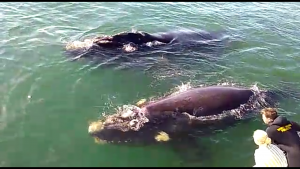 Southern right whales – taken from White Shark Projects cage diving vessel, Shark Team, while we were on anchor.